Emotional eating needs an antidote. Calm and peace are the antidotes. They are also the most difficult things to get when you’re in the process of being agitated by a feeling and you know the short answer is to eat. And then you have to deal with the guilt and shame about eating when you really didn’t want to, but you did want to, but you know that in the long run, it didn’t really help anyway. Part of what can help is to distract yourself. After about 20 minutes the urge may fade, especially if you really aren’t hungry. You might find that after 20 minutes you really are hungry and you need fuel. But, distraction isn’t the solution either. You need tools to help you work through the feelings, understand them better and, most important, what to do to get through to the other side without using food. 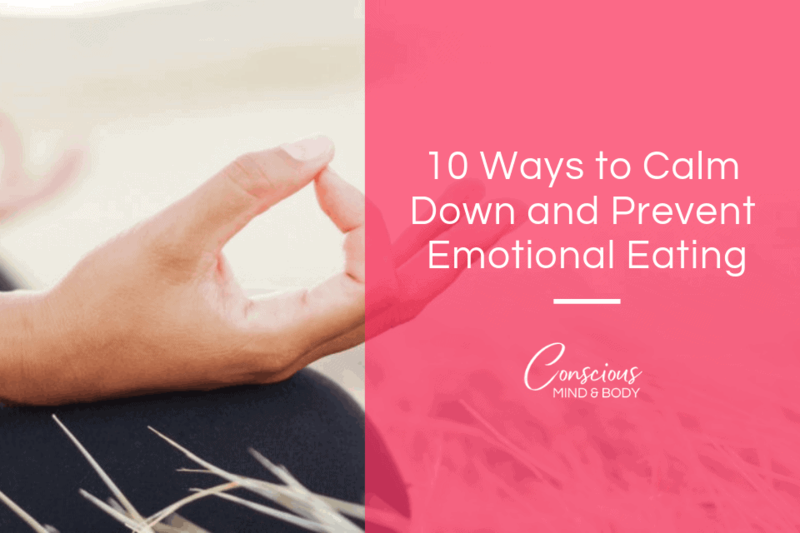 Here are my top 10 ways to calm down and prevent emotional eating. When the emotional eating urges start to creep in anxiety is usually the culprit. Anxiety is what drives the urge to eat to calm the underlying feelings. You may not be able to identify the specific feelings or that feeling might be too overwhelming or you just don’t have an idea of what to do with it. One of ways to decrease anxiety is to discharge the excess energy it provides so you can come back to it later and figure out what you need. You can do this through a workout, a walk, stretching or even smaller movements, like needlework, knitting, etc. Talking it out with yourself, someone else, your dog, you know what I mean, just speak out loud to yourself so you hear your voice. It gives you just a tiny bit of distance to get the thoughts in your head out. Hearing yourself, allows you to hear the tone and meaning of the words differently than thinking them in your head. This slows you down so you’ll get a clearer idea of what and how you truly feel. When you make something creative it helps your brain think of new creative solutions. You might make connections between thoughts and feelings that you wouldn’t have as you rush through the day dismissing yourself as you take care of business. Regardless of whether you think of yourself as an artistic type, what I’m talking about is on a much smaller scale. Knitting, paint by numbers, painting without numbers, coloring, needlepoint, wood carving, model building, etc. Anything that you can have available that’s small, uses your hands and is inexpensive. The goal is to get your hands moving and get out energy and help your mind shift the focus to something else. What’s important is that this is something that you don’t have to worry about the outcome. The finished product may never get finished or it might be given to charity or it might just go in the recycling bin. A calming and relaxing experience helps you move through the urge to emotionally eat. When you’re hungry, eat! There is nothing that will replace the need for fuel. The hungrier you get, the more likely you will mix up emotional eating or binging with your body’s natural reflex to make up for missed nutrients. This probably leaves you feeling worse and out of control. The very opposite of what you were aiming for! When you’re alone and feeling anxious or down, isolation keeps the spiral moving in unhelpful directions. Companionship on the other hand, even when it’s as small of an interaction as exchanging pleasantries with a cashier at a store can do wonders to affirm that you’re not alone. Companionship also helps you to break out of your own thoughts, it can help you gain some perspective on your emotions and give you a break from focusing on yourself. Do something just for fun. Again, it gets you out of your head and thinking about other things than your worries. Make sure your entertainment is supportive of your goals. Does it keep you locked in the patterns you’re stuck in or does it help you move past the stuck point and toward a new understanding of your emotions and what you want? If the entertainment is scrolling through your social media feed, probably not going to be helpful, but if it’s watching your favorite movie that you find uplifting, probably helpful. Writing is a great way to get to know yourself and work through what it is that you want. Journaling can take many forms. You can do it in bullet journal style, with short points and drawings. You can write it out in a beautiful hand bound leather journal or on a scrap of paper. The point is that when you get the thoughts onto paper you can see what your thinking, determine how your thoughts and feelings affect your behavior and make the changes you need to make. Planning does not need to take a lot of time or effort. Planning can be as small as making sure you have what you need for lunch or that you get your clothes ready the night before or that you use a calendar where you can see your entire week and determine what you need to take really good care of yourself, given your activities. Put your self-care into the plan for your day, week, month, your life. You’ve got to know what you’re dealing with to know what to do about it. This can be the most difficult time to calm yourself – when you’re not sure what the feelings are. The process of naming a feeling is one way to get you there. One great way to identify the feeling is to take the first one that pops into your head, think about some other words that are related or use a thesaurus or download the worksheet that accompanies this article and feel if one of them “hits” you as being the one. This will take practice and like any skill, it will be difficult at first and over time you will get better. Allow yourself quiet time to sit through life’s distractions. Unplug and allow your brain to have a break from all of the stuff going in every day. Allow yourself time to just sit without another requirement on your time, energy or relationships outside of yourself. It could be sitting for 5 minutes, 15 minutes or longer. The goal is to just be quiet with yourself. Healing emotional eating is one of the most difficult and at the same time freeing things you can do for yourself. Take the time to get to know what you need and got for it!